Represents an Objective-C protocol declaration. This says that NSDraggingInfo requires two methods and requires everything that the two "referenced protocols" 'refproto1' and 'refproto2' require as well. Definition at line 2063 of file DeclObjC.h. Definition at line 2125 of file DeclObjC.h. Definition at line 2146 of file DeclObjC.h. Definition at line 2147 of file DeclObjC.h. Definition at line 2126 of file DeclObjC.h. Definition at line 2239 of file DeclObjC.h. Definition at line 2238 of file DeclObjC.h. Definition at line 2259 of file DeclObjC.h. Definition at line 2260 of file DeclObjC.h. Definition at line 1939 of file DeclObjC.cpp. This routine collects list of properties to be implemented in the class. This includes, class's and its conforming protocols' properties. Note, the superclass's properties are not included in the list. Definition at line 1923 of file DeclObjC.cpp. Definition at line 1855 of file DeclObjC.cpp. References clang::C, clang::ASTContext::getLangOpts(), and clang::Result. Referenced by clang::Sema::ActOnForwardProtocolDeclaration(), and clang::Sema::ActOnStartProtocolInterface(). Definition at line 1866 of file DeclObjC.cpp. Retrieves the canonical declaration of this Objective-C protocol. Definition at line 2249 of file DeclObjC.h. Referenced by clang::ASTDeclReader::VisitObjCProtocolDecl(), and Write__ivar_list_t_initializer(). Definition at line 2250 of file DeclObjC.h. 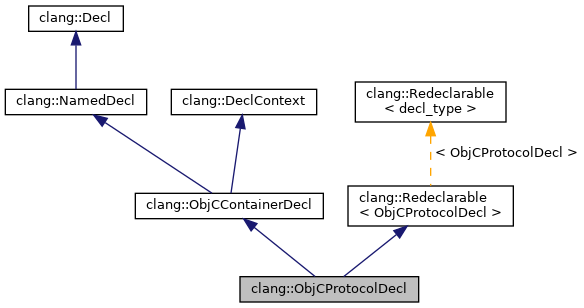 Retrieve the definition of this protocol, if any. Definition at line 2209 of file DeclObjC.h. Referenced by clang::Sema::ActOnStartProtocolInterface(), ClassImplementsAllMethodsAndProperties(), clang::ObjCPropertyDecl::findPropertyDecl(), clang::ObjCContainerDecl::FindPropertyDeclaration(), clang::Sema::FindProtocolDeclaration(), getBlockLayoutInfoString(), clang::serialization::getDefinitiveDeclContext(), clang::ObjCContainerDecl::getMethod(), clang::ASTImporter::ImportContext(), clang::ASTNodeImporter::ImportDefinition(), NestedProtocolHasNoDefinition(), clang::Sema::ParseObjCProtocolExpression(), clang::ASTNodeImporter::VisitObjCProtocolDecl(), and Write__ivar_list_t_initializer(). Definition at line 2214 of file DeclObjC.h. Produce a name to be used for protocol's metadata. It comes either via objc_runtime_name attribute or protocol name. Definition at line 1960 of file DeclObjC.cpp. Definition at line 2120 of file DeclObjC.h. Definition at line 2231 of file DeclObjC.h. Determine whether this protocol has a definition. Definition at line 2197 of file DeclObjC.h. Referenced by NestedProtocolHasNoDefinition(), and clang::Sema::ParseObjCProtocolExpression(). Determine whether this particular declaration is also the definition. Definition at line 2220 of file DeclObjC.h. Referenced by clang::Sema::FindProtocolDeclaration(), RewriteOneForwardClassDecl(), and clang::ASTDeclWriter::VisitObjCProtocolDecl(). Definition at line 2192 of file DeclObjC.h. Definition at line 2188 of file DeclObjC.h. Definition at line 1890 of file DeclObjC.cpp. References clang::Decl::getASTContext(), getDefinition(), clang::ObjCContainerDecl::getMethod(), and clang::Decl::isHidden(). Definition at line 1875 of file DeclObjC.cpp. Referenced by lookupProtocolNamed(), and UseNSOptionsMacro(). Definition at line 2132 of file DeclObjC.h. Referenced by getBlockLayoutInfoString(), and clang::ASTNodeImporter::ImportDefinition(). Definition at line 2139 of file DeclObjC.h. Definition at line 2153 of file DeclObjC.h. Definition at line 2160 of file DeclObjC.h. Definition at line 2149 of file DeclObjC.h. Definition at line 2167 of file DeclObjC.h. Definition at line 2128 of file DeclObjC.h. Referenced by findProtocolsWithExplicitImpls(), NestedProtocolHasNoDefinition(), clang::ASTContext::ProtocolCompatibleWithProtocol(), PushProtocolProperties(), clang::ASTDeclWriter::VisitObjCProtocolDecl(), clang::TextNodeDumper::VisitObjCProtocolDecl(), and Write__ivar_list_t_initializer(). setProtocolList - Set the list of protocols that this interface implements. Definition at line 2176 of file DeclObjC.h. Referenced by clang::Sema::ActOnStartProtocolInterface(), and clang::ASTNodeImporter::ImportDefinition(). Starts the definition of this Objective-C protocol. Definition at line 1915 of file DeclObjC.cpp. Definition at line 2108 of file DeclObjC.h. Definition at line 2109 of file DeclObjC.h. Definition at line 2110 of file DeclObjC.h.